In the newest update of Construction Simulator 2, publisher astragon Entertainment and the weltenbauer. developer team are able to add two new license partners at once to the game: The US American truck manufacturer Mack Trucks and the vehicle and machine producer MEILLER Kipper, which is based in Munich/Germany. Thanks to this new license cooperation, virtual builders are now for the first time able to use vehicles and machines such as the Mack Titan tractor truck, a Mack Granite with a MEILLER AM12 asphalt tipper body, a Mack Granite with a MEILLER P330 rear tipper body, a Mack TerraPro with a Liebherr 41 M5 XXT concrete pump as well as a MEILLER MHKA Semi-trailer. In addition to these changes, the original forklift of the game has been replaced by a new model, so that forklift fans can now look forward to complete their loading tasks with a real STILL RX60-80 forklift! Next to the new vehicles there have also been new missions added to the game, which will give players ample chance to make extensive use of all of their new machinery. On top of all this, owners of smartphones and tablets using the Android are now able to play the game with external game controllers thanks to the newly integrated experimental controller support. 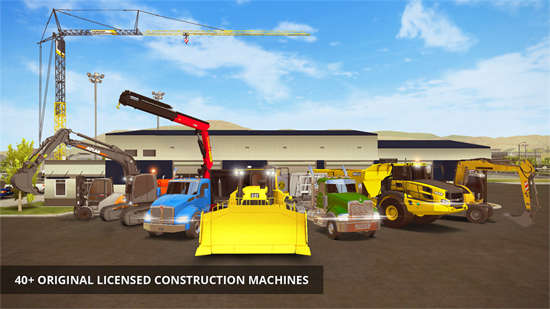 Construction Simulator 2 offers players more than 40 originally licensed vehicles and machines of popular makers such as Caterpillar, Liebherr, Palfinger, Bell Equipment, STILL, ATLAS, Kenworth, Mack Trucks and MEILLER Kipper as well as more than 70 challenging building tasks. In addition to Construction Simulator 2 there is also the free Construction Simulator 2 Lite, which allows players to test the game before upgrading it to its full version with access to all of the game’s features. To properly celebrate the release of its newest free update, Construction Simulator 2 as well as the upgrade from Lite version to the full game will be available for a special price of 1.99 EUR / 0.99 USD / 0.99 GBP on the Apple App Store from November 30 until December 8, 2017!